In 2005, the Hayabusa spacecraft developed by the Japan Aerospace Exploration Agency (JAXA) landed on Itokawa, a small near-Earth asteroid named after the famous Japanese rocket scientist Hideo Itokawa. The aim of the unmanned mission was to study the asteroid and collect a sample of material to be returned to Earth for analysis. Contrary to scientific predictions that small asteroids are barren nuggets of rock, photographs taken by the Hayabusa spacecraft revealed that the surface of Itokawa is strewn with different sized particles. Even more puzzling was the lateral separation of small and large particles – with large boulders occupying the highlands and small pebbles occupying the lowlands. Researchers at the Okinawa Institute of Science and Technology Graduate University (OIST), Japan, in collaboration with researchers at Rutgers University, USA, have used a combination of experiments, simulations and analyses to propose a mechanism underlying the lateral size-sorting of particles on Itokawa: small pebbles hitting the surface of Itokawa rebound from boulders but sink into pebble-rich regions. Size-sorting of particles on Itokawa was formerly attributed to the Brazil Nut Effect (BNE) in which particles of different sizes separate during sustained vertical shaking in the presence of gravity. Similar to the phenomenon in which shaking a box of granola causes large clusters to rise to the surface and smaller oats sink to the bottom, large boulders rise to the surface of asteroid rubble piles, while smaller pebbles sink. 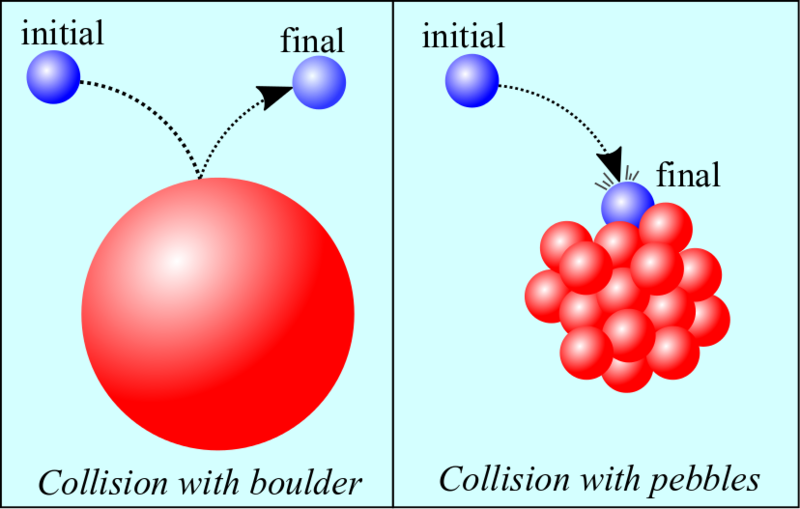 But even if the BNE can account for boulders rising to the surface, it fails to explain the observed lateral segregation of particles. “Together with researchers at Rutgers University, we have come up with a simpler and more viable reason for the size-sorting of particles on Itokawa,” says Professor Pinaki Chakraborty, head of OIST’s Fluid Mechanics Unit. The findings, published in Physical Review Letters give insight into the formation and evolution of small asteroids, providing a window into the early stages of the solar system. From the photographs, it can be observed that volumes of boulders and pebbles on the surface of Itokawa are comparable, meaning that there must be many more pebbles by number. It follows that most collisions that formed the asteroid must have been from small particles. This is significant because when a pebble hits a boulder it rebounds, whereas when it hits a sea of other pebbles its momentum dies. The researchers predicted that this process – which they termed ‘ballistic sorting’ – could underlie Itokawa’s size-sorting phenomenon. To test this experimentally, researchers at Rutgers University dropped sand particles on to a ceramic plate to model pebbles colliding with boulders and other pebbles. They observed that when sand particles hit the plate, they bounce off, but when they hit a mound of sand, they aggregate, leading to growing sand piles. “These initial experiments show that falling sand bounces away from boulders, but stays near sandy regions,” explains Professor Troy Shinbrot from Rutgers University and lead author of the study. Next, Prof. Shinbrot and colleagues dropped sand particles on stones that were randomly placed at the bottom of a box. Measuring the size of the sand islands over time, the team showed that the area of the islands grows according to the Hill equation, which is used to describe processes in which an initial accumulation promotes further accumulation. In order to test if these experimental results apply to Itokawa – which has much lower gravity than Earth – Dr. Tapan Sabuwala from OIST’s Continuum Physics Unit, conducted computer simulations in which he varied the gravity and quantified the ballistic sorting effect by dropping pebbles on a substrate of boulders and pebbles and tracking each pebble’s trajectory. He found that pebbles that hit boulders travel further than pebbles that hit other pebbles, irrespective of gravitational pull. Based on both experiments and simulations, the team concluded that low speed deposition of pebbles results in a predictable growth of pebble seas. Preliminary imaging of asteroid Bennu, which is comparable in size to Itokawa, suggests that it also exhibits lateral size segregation of particles on its surface. A NASA-led exploration of Bennu commencing in 2018 is expected to give further insights into the extent of ballistic sorting.